Use as a mortar or tile grouting gun. Ideal for re-pointing walls, filling gaps in patio slabs and grouting floor and wall tiles. 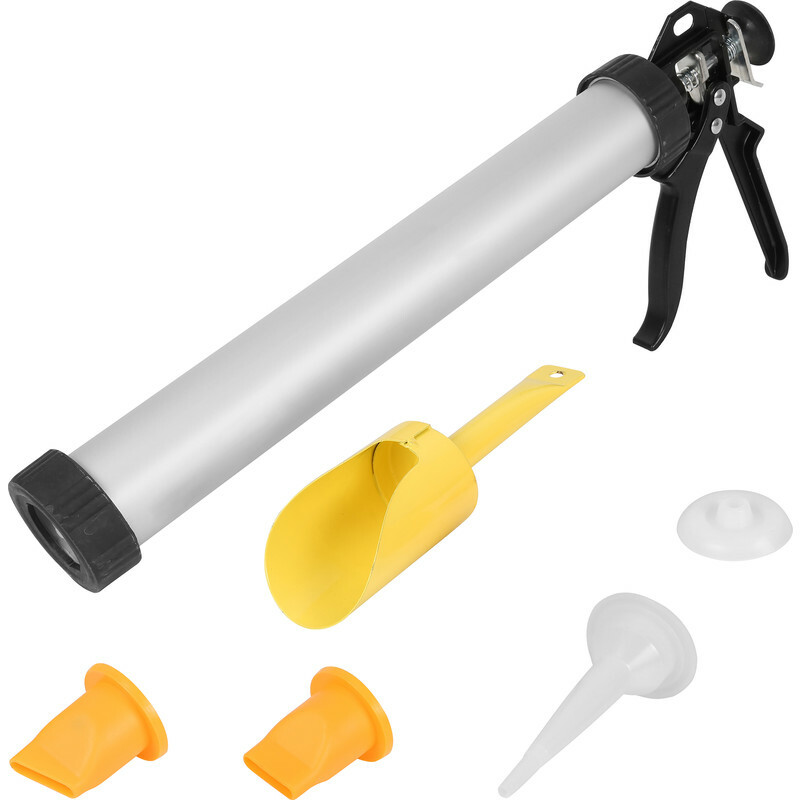 Includes: mortar gun, filling scoop, straight nozzle, angled nozzle, grouting nozzle and plunger. 34203 includes: 5 x plungers, straight nozzle, angled nozzle, and grouting nozzle. Roughneck Mortar Gun is rated 2.6 out of 5 by 44. Rated 5 out of 5 by JdeB from Easy to use Excellent bit of kit for grouting patio slabs. Easy to keep clean during use. Rated 5 out of 5 by Mozzer99 from Works well with lime mortar Struggled to repoint 1919 house lime mortar. Bought this and it was a revalation. Using 3 to 1 NHL 3.5 hydraulic lime ( soft sand blend and pigment) it worked a treat. Came out like silicone. However even using a 1/4 bucket of mortar over 1/2 hour the slight stiffening of the mix became quite noticeable and I learnt at that point to chuck it away. Adding water led to staining of the bricks. I'm sure cement mortar would be harder to get the right consistency. An angled nozzle would be a big help, I could one of those supplied off at an angle to help get round scaffolding. Rated 2 out of 5 by MTUK from Didn’t work for me I got this based on video recommendations but for my purposes, re-pointing the patio paving slabs, it didn’t work. When put under pressure, the very liquid mortar almost turned solid. Rated 2 out of 5 by Al2707 from Mortar gun This gun is a load of rubbish... lasted 2 rounds of soft creamy mortar, and plastic burst at end.. Rated 4 out of 5 by Big Dave 42 from Useful. First unit failed on 1st use, 2nd better I was raking out the mortar between cinder blocks and needed to squeeze new mortar between them - this was the ideal tool for that job. First unit broke on first use (locking ring at back of unit snapped - probably a manufacturing defect). Took it back to Toolstation, it was exchanged without any argument, and 2nd unit worked beatifully through many many uses. Best advice is to keep a bucket of clean water on standby ready to wash the unit immediately after you're finished with it. Overall, great product for cases where you need to squeeze mortar into a narrow gap - I think my first unit was simply flawed in manufacture. Rated 3 out of 5 by houseman from Roughneck Mortar Gun This tool is ok, but you have to be ready for it! The supplied 'scoop' is larger in diameter than the tubular body of the gun, so very quickly, the threads of the tube get covered in mortar. Have a number of wet dry clothes ready to wipe the threads clean after you manage to fill it. The mortar from the scoop, therefore, does not flow easily into the tube, so you need to have something to break the resulting airlock, which prevents the mortar from filling properly into the tube. Any air gaps inside the tube will result in you not being able to expel the motor later. I used the 'orange' adaptor first, and soon realised that I needed a 'wetter' mix than my first effort. So you take it all apart, and expel and waste your first load, and discover that you did indeed leave an airlock in it! Take the opportunity to wipe the threads again. Mix a 'wetter' mortar, and, again, using the orange adaptor, you get a good result. Surprisingly, I didn't get and 'drips' that most people have reported. (But that comes later!) I then reloaded with the 'fine white' adaptor, but forgot to clean the threads) and press all I could, I couldn't get any mortar out of it. But, you guessed it, I did get the water leaks that everyone has reported! So take time to cover all your work area, because, before you know it, you will get drips everywhere. Noted also, is that the tube to adaptor has no rubber seal, so these 'drips' are most likely! I ditched the idea of using the 'fine adaptor', and whilst my mortar mixed dried, I managed to use other tools to fill the smaller gaps that I had hoped this 'mortar gun' would have easily done. I have cleaned the tool afterwards, but would suggest you get something like a toilet brush for this, and leave yourself a good thirty minutes for the task at the end of your day! I will try it again tomorrow, but I will only be using the 'orange' adaptor. Overall a tool to have available in the garage, but I would only recommend it if you have the time, and unending patience.